…Through the lens of Emily Alldis. The Scribble pen is an amazing piece of technology that allows you to pick up to 16 million colours worldwide and draw with that colour before your own eyes. Working on both pen and tablet, you press the end up against the colour you desire, and it will save the colour, allowing you to go to new levels of drawing. I thought this idea was amazing. Knowing that you can use almost any colour in the world, and be spoilt for choice when you begin drawing. This reminded me of the idea of me scanning the QR code on my tag to feed back to the app; the ideas are similar that it picks up that specific code of that product, and it saves it for you if you wish. What I found interesting was that the colours converted for Scribble are converted to RGB, CMYK and HEX, the 3 colour conversions that give that shade its identity. I thought this was inspiring to include in my project and the clothing. When an item of clothing is saved, I could show the colour identification(s) within that clothing item, which essentially could help those who are colour blind match even closer to other groups of clothing to make sure that they are not getting confused with similar tones. Simon Phipps challenged the perception of different buildings and the beauty within them. Over 15 years, he went around the UK taking pictures of different iconic, and mostly concrete, buildings. Inspired by the work of Le Corbusier, he wanted to show people there was more to the overall appearance of some architecture that may not necessarily be to everyone’s taste. He experiments with perception, capturing a different angle in all directions on the buildings, giving them the abstract feel and appearance. What attracted me to attending this exhibition was the inspiration of his abstract appearance to his work. I love how he has angled his picture deliberately, ensuring there is no straight line or perfect shot. Architecture photography is something I am becoming fonder of, because of the pattern you can get out of every shot. The black and white contrast adds depth to every picture also, which is something I would like to play around with in my pictures, rather than using lots of colour for a change. I feel inspired to try and use his work as ideas to how I can incorporate that style into my pictures, and possibly ideas for a project on giving a sense of abstraction. The Colour and Vision exhibition is an exhibit taken place at the Natural History Museum, London. The exhibition explains how vision and colour has evolved over the duration of around 500+million years. It goes through some of the oldest fossils of organisms that lived around that time, to animals today. The exhibition was fascinating in understanding the knowledge of how complex the eye is. As you walk around, you get an understanding of how the eye originally was ‘flat’, and the retina and the shape of the eyeball evolved over time to allow us to see what we see today. Showing eyes from different animals, interacting with our personal views and finding out why we see what we see today, it makes you wonder how much more we as humans, as well as animals, will be able to see in the future. The connection of colour and vision has led us to where we are today, going down the food chain in how predators had to try and find their prey to hunt. Pick Me Up, SONY World Photo Awards and Dutch Flowers. We were given the chance to explore the annual exhibitions, Pick Me Up and the SONY World Photo Awards 2016. Both of the exhibitions show a variety of work from all different people around the world. Pick Me Up is an exhibition that presents graphic arts from new and upcoming designers. The work that I saw I felt this year was much more illustrative and showed a lot more typography in the styles than the previous year. Although typography is not my greatest level of interest, the artwork presented with this was astonishing. Rachel Lillie’s work was a series of illustrations of the woods where she had gone exploring. What she is trying to show people in her work is to look at the details in what is around you. I felt this was a perfect example of what I am trying to demonstrate with my activity book. Her work is the perfect example of making the audience think about looking in the box, other than looking at the box as a whole. At the end of the exhibition, I noticed a book by Rob Ryan with his cut outs. Rob Ryan was a huge inspiration to me in the past, encouraging me to want to cut out in his style. The level of detail and concentration needed was intense, but the outcome was worth the time! The reminder of his incredible work has got me thinking about possibly coming back to do this style again at some point in another project. The SONY World Photo Awards 2016 in my opinion was so incredible. There was not one single photo that I would say I liked the most, because every picture told a different story, and each photo was completely different. What I did pick out as I was walking around was that I particularly enjoyed looking at the photos that showed a different perspective on things. Taking Philip Joyce’s image of the horses at the races as an example, the photo of the horse from above caught my attention, because it is from an angle that you are not used to seeing from a horse. Similarly, Cheung Yin Fang’s Creation of Love using the effects of a fast shutter speed was beautiful. I prefer split second shots than long exposures, because you can capture something that the human eye may not have picked up on when you look at it. Lastly, I had a quick walk around the Dutch Flowers at the National Gallery. The paintings from the 17th/18th Century display realistic looking flowers of all types. The ‘Dutch Flowers’ include paintings from artists such as Ambrosius Bosschaert the Elder, Jan van Huysum, and Rachel Ruysch, who each display a picture perfect scenery of different flowers and objects around them. The attention to detail was to a point that I could not even make out the brush strokes, confusing me to how they even painted it so perfectly! What I noticed about each of the exhibitions that I went to was the attention to detail in everything that was displayed. It was clear that the work was made for a purpose, and that everything had a reason behind it. Today, I decided to take an adventure around Paddington and near Hyde Park. It was a really nicer walk around the area because of the peace and quiet happening. A while ago, I watched a program about millionaires in London who build underground-pent suites; I saw one of these being constructed today as I was walking and half the road was turned up! It was quite funny to watch and see exactly where in London this happens. The first place I went to was the Rolling Bridge. The Rolling Bridge is an installment made in 2004 by Thomas Heatherwick. The bridge every Friday at noon rolls, and then unrolls for people to see. It lasted about 5 minutes, but it was a really cool experience to watch. The bridge when it is halfway up looked massive; a fun experience. The second place I checked out was the Fake House. The Fake House hides the pathway where an underground rail line leads, giving a fancy illusion of a real house. I heard a story that a long time ago, someone had written invitations to this party and asked for donations from people. The people turned up to this so-called address to find out they had given away their money to someone, and were invited to a fake party! The last destination was the Smallest House in London! It was built to block a right of way to St. George’s graveyard to deter grave robbers back in the 18th Century. The house is still occupied today to a lucky person, giving a beautiful view of Hyde Park right in front. What I’m noticing as I’m travelling around London, is the tiredness! All of my trips are not to be made in one day, and each page I hope will show that. 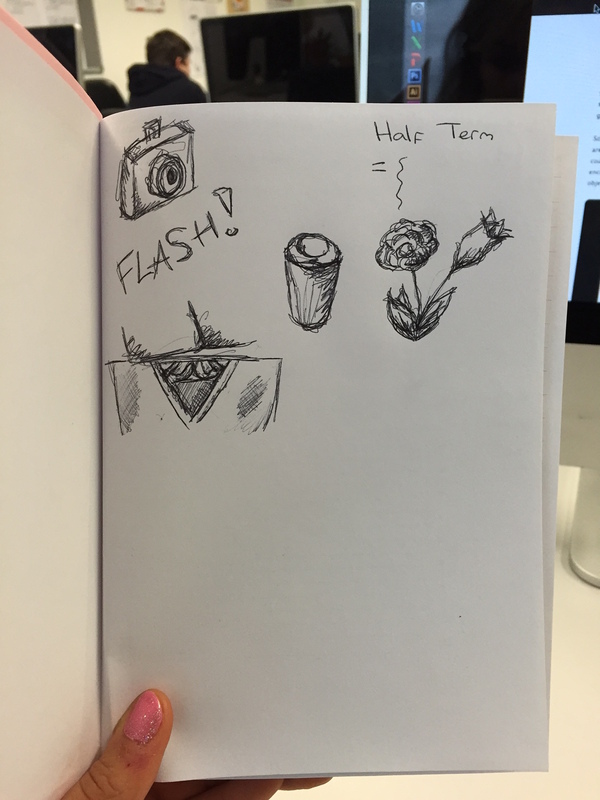 I intend to show on each page I make for my activity book that you can make a day out of each page, despite there’s not much information on the pages. London’s only lighthouse 1864-66 at the Trinity Buoy Wharf was the testing venue for new types of lamps and lighthouse technology. The place today is a venue full of art, sculptures and all different things to look at as you walk around. Although the actual venue itself is exciting, I was there for the lighthouse (! ), as what the activity book will focus on. Pierre Vivant’s sculpture 1998 was part of a competition. The Lighthouse Tree imitates the natural landscape and the lights show the rhythm of a never-ending city pattern. The traffic light tree was something really unusual to look for. Although there are endless amounts of sculptures in London, I was really excited to see this. One recommendation would be to view it at night-time to see whether the lights will turn on. The Greenwich foot tunnel is something a lot of people walk past but have no idea what it is, because there is a massive ship next to it that is a huge tourist attraction. The foot tunnel leads to the side near Canary Wharf, and just the walk in itself is exciting, knowing you are walking beneath the Thames. Queen Caroline’s bath was the only remains of her house. This bath is shown at Greenwich Park, which adds a nice feature when you are walking around the park. Queen Caroline was the wife of King George IV, who lived in the Montague House 1798-1813. The house was demolished a year after she fled from England. I’m starting to end the stretch of my travelling. As I am going around, I am realizing that when you know the story of something before you go to see it, what you see is a lot more interesting. There are quite a lot of places I wish I could have gone to, but were either inaccessible or I just couldn’t find them (!) such as the Cockney cash machine, which was a real shame. Nevertheless, so far it has been a really memorable experience to find parts of London people wouldn’t know have existed. The Roman Amphitheatre at the Guildhall Galleries I must admit appeared a little creepy. Being the only one in there and walking down to what first appears to be a room of darkness looks suspicious and eerie. Inside however is not quite like any usual remains of Roman architecture. The layout and the additional lighting of people made it much more interesting to look at. Definitely not the usual Roman Villas trip I’m used to. In 200AD London was defined by one massive city wall. The castle is accessible through a tunnel, giving you a 360-degree view of London. Although there is not a huge amount to see, I thought it was interesting to see how small the perimeter of London used to be, and how different everything about London today is from back in 200AD. What I appreciate about these ruins is that they are preserved and looked after, because they are an important part of history for us, despite the ever-growing need in the city for fancy buildings! Kingsway Tram Subway is a connection that went from Holborn to Waterloo from 1906-52. It was only around for a short period of time, but it’s finding both ends that’s the exciting part. People walk under Waterloo Bridge without glancing at a huge set of double doors that is cleverly decorated. All the time up until now, I thought that was actually an entrance to a restaurant (or something) oops…)). Also, if you are willing enough to follow the entire path on the road, you can see through the drains steps leading to the tunnel that were used as a fire exit when the tram was open. Another interesting discovery when looking through drains is Little Compton Street. This was one of my most exciting findings when I was researching what was around London! This was because it is so hidden you would not expect it to be hidden where it is at all. The street was built over to make the grounds more level when building Charing Cross Road 1896. The reason for leaving the signs and a small section of the street still remains a mystery. Britain’s smallest Police Station just about fits a person. Originally, it was used as an ornamental light fitting 1826, until Scotland Yard took it over in 1926. Today it is used for storing cleaning supplies for the streets. Its really fun to find all the weird and wonderland parts of London, especially when you know you must have walked past it 100+ times, it shows that there’s a lot more to London than landmarks. I am hoping with my activity book, it will encourage people to look more into the details of London, than the overall picture. 41 Cloth Fair is the oldest standing house in London. Built around 1597-1614, it is known to be the only house to have survived the Great Fire of London 1666. How did it survive? It was enclosed and centered between the houses that were on fire. Presumably it had a garden circling around it. When you look closely at the house, you can pick out tiny elements beneath the patchwork of the original design of the house. St Martin-In-The-Fields Church had a window installed by Rev Nicholas 1994. The funny window at first sparked questioning about the different design, but Rev explained it was to rework ‘Christianism’ and Modernism and put them together using the cross and grid pattern. Being a designer, I love things that are different (evidently with this project), and this shows the perfect example of showing something new but appropriate, yet it is hard to miss! The Thin House is another one of my favourites. As narrow as 7ft wide, this triangular shape gives the optical illusion that the house is this thin throughout. The reason for this adjacent shape is because of the railway line. When constructing the house, it was underestimated on the space, and because they couldn’t build over the railway, nor could they stop, they created the ‘Thin House’. York Watergate was originally the site of the original course of the Thames before the construction of embankment in the mid 19th Century; the river was moved to where it is today. The York House was built 1620 for George Villiers, the first Duke of Buckingham. The Watergate was a way to the house via the river, built in 1626 by Inigo Jones; the iconic structure is the only remains of the house. The corrosion of the architecture is evident, but it surprised me how I had missed this all the time I had been walking past it previously. Its shocking how detailed the Watergate is, the size of it puts into comparison of how vast the mansion must have been to match this beautiful construction. I thought it would be a sensible idea to make the most out of my research as possible, as soon as I could. I decided to explore the Kyoto Garden, located in Holland Park, Kensington. The park was designed to bring a sense of peace and beauty in the city of London, a place for people to relax. I thought this would be a great place to begin with my exploring, because it is near to where I live, and easy to access to. The garden is beautiful, reflecting the colours of the plants in the water and the sun reflecting against the waterfall. This place was somewhere to go to relax and enjoy some personal space away from everything. I even did a few quick sketches at the park while taking photographs, I drew sketches based on what was around me, I drew what I saw when I looked down (me sitting on a bench) and enjoyed drawing whatever I felt like drawing, in the style that I wanted to. Can you locate where this photo was taken? Can you replicate this photo in your own style? By asking people to do these challenges, it would build up and create almost like a scrapbook of memories for them to look back and enjoy one day. How to get a good night sleep. As I was exploring around the heart of London, I decided to extend my personal research in exploring somewhere different. Inspired from the workshop with Carlos, he mentioned the idea of drawing things out and opening your mind to different things, so I decided to walk from Kensington to Chiswick, a good hour or so, instead of grabbing a bus to see what I could find while I was travelling. I was amazed with what I had discovered, despite London is right on my doorstep. As I was walking, I noticed that the Thames was not looking as built up as it had in the centre of London, people were punting and the housing was looking more like regular streets. Some streets reminded me of small villages. As I was walking, there was a small part of the journey that made me forget I was in London, because I could not see any more office buildings, and the landscape reminded me of scenes that I would find in places like Cambridge. Although the walk was draining, I managed to get some really good pictures and explore new parts of London that I never knew were around where I lived. I’m really enjoying producing pictures with an abstract feel to them, and incorporate them in my design work. The Magical Lantern Festival is a festival to celebrate Chinese New Year. Usually it only occurs abroad, but London was fortunate to have this fantastic opportunity held in Chiswick. 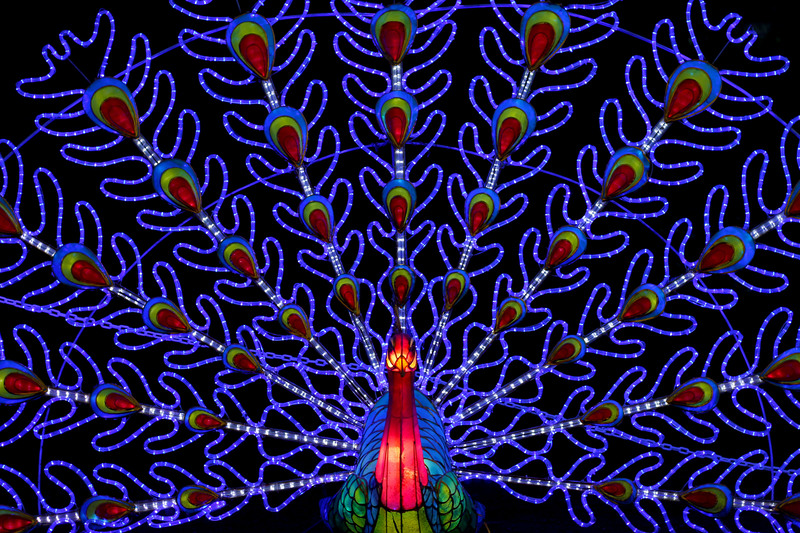 The lights displayed magical light displays, exploding with colour and decoration of animals and objects, showing a fun side of lanterns and art. 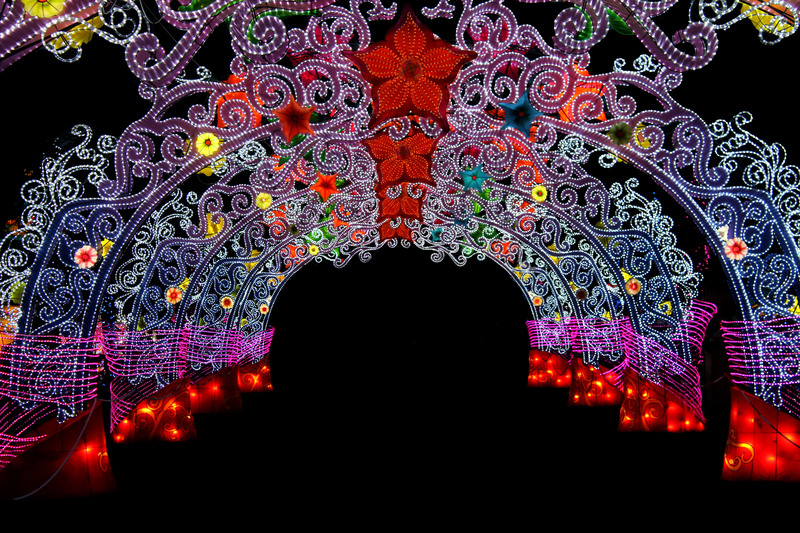 I thought this exhibition was worth travelling to see, the hour long walk showed lights, patterns and beautiful displays as you walked through, giving you something different to look at all the way through. Although this did not link to my book, it definitely was worth going to have a look at this one in a lifetime opportunity. This exhibition will benefit me however, as it was inspiring to see such a beautiful show entirely out of lights in the dark, making you feel like you are in wonderland. I really enjoyed how they managed to keep you engaged throughout the journey with the exciting designs; a real treat for a family ‘night out’!